If you spend time in Wil Friedman's BraunAbility van, you would most likely notice its new-car smell. That's because as a repeat BraunAbility buyer, he's gotten a new van every two years for the last 20 years. And that's not because the BraunAbility vans he's owned were worn out. "In the 20 years I've had BraunAbility vans, the only problem I ever had was a rear lightbulb went out. Can you believe that?" Friedman said. Through the U.S. Department of Veterans Affairs (VA), Mr. Friedman qualifies for a new wheelchair accessible vehicle every two years. What is amazing is that he hasn't gone through more. "I hated the idea [of a van]," Friedman said, "until I got in it." He was used to his car and found it intimidating moving from that to a larger van. While serving in the Korean War in the 1950's, Friedman sustained a spinal cord injury, became a paraplegic, and was released from active duty. Back then, he said, he was lucky to have survived the injury. He eventually found his way back to driving by outfitting his car with hand controls that he worked with General Motors to design and operate. For many years, he was able to transfer into his car, but undergoing rotator cuff surgery put an end to that. Now that he had to look at wheelchair accessible vans, with the phrase itself leaving a bad taste in his mouth, he worked with the VA and an adaptive driving instructor. The instructor recommended a BraunAbility Town & Country - It was the original, they said, and it was the best. Friendman was sold. "When I find someone good, I stick with them." Friedman and his wife live in Las Vegas, where he has been fully enjoying his retirement. 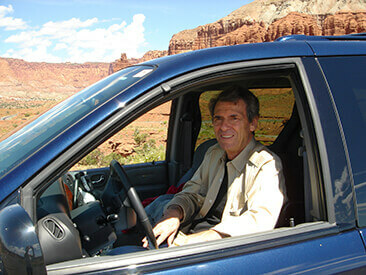 They especially like driving to Nevada and southern Utah with their expanse of canyons. "Passing through small towns is our favorite. Have you been to a small town?" Friendman asked. (Note: Winamac, Indiana, where his vehicle is built, is a very small town.) "It's like going back in time, with the old diners and old-fashioned stores." Friedman will continue to travel to the past with the vehicle of the future for years to come. Thanks to his dealer, Ability Center, who "go out of their way to help," he will have many more years on the road to take full advantage of his retirement!